Tig Welding is the most Versatile Welding Process on the Planet. "Tig Welding might not be as fast as mig, but it is much more versatile. Just by switching rods, you can go from carbon to stainless to inconel to titanium. " Gas Tungsten Arc Welding (GTAW) is called TIG welding by welders. Old timers still call in Heliarc. Some people insist on trying to call it Gas tungsten arc welding (GTAW) saying that the term TIG is incorrect. I’m cool with that. The whole thing is kind of ridiculous, like arguing the difference between the words motor and engine. Welders will always use the term they are comfortable with, the one they learned first. Tig Welding aluminum requires Alternating current (except in very rare cases...click here to see a video using DCEN and helium to weld aluminum. one of the best things that will help you tig weld stainless steel is a gas lens. TIG, welding can sometimes be done without using Filler metal but this only works in certain applications...like food service code welds on kitchen equipment where looking smooth and clean is sometimes more important than weld strength. Most of the time filler metal is used to allow for a full strength weld. The techniques used in TIG are similar to those used in Gas welding because both hands are used in manipulating the torch along with the filler rod. TIG pinpoints the heat much better and a foot control is often used to regulate amperage. There are dc and ac/dc power units with built-in high frequency generators designed specifically for TIG. These automatically control gas and water flow when welding begins and ends. If the torch is water-cooled, a supply of coolant is necessary (It is best to use a coolant recommended by the manufacturer in order to get the best performance and longest life from your torch). TIG Torches are made so that electrodes and gas nozzles can readily be changed. Automated TIG welding equipment may include devices for checking and adjusting the welding torch level, equipment for work handling, provisions for initiating the arc and controlling gas and water flow, and filler wire feed mechanisms. I stuck with 2% thoriated for a long time. It worked but on A/C the tip kind of got jacked up at high amperage. I tried 2% lanthanated and learned that it works great and even better on A/C. And For TIG inverters like the Miller Dynasty 200dx or the Lincoln Invertec v205t, it is Da shizz. because it holds up really well at high frequencies like 120-150 HZ. It stays sharp on DC too. The only drawback is that is does not break easily...you have to cut it with a grinder. It is not as brittle as thoriated. But if there is anything to the caution about radioactivity, (I still haven't bought in) then it is definitely worth swapping over to lanthanated. Its a rare thing that a safer substitute works as good or better than the real deal. Nickel alloys like Inconel, Hastelloy, Waspalloy etc. When it comes to Tig equipment, Miller tig welding machines are hard to beat. I am sure other manufacturers of TIG equipment make quality tig welding machines but what about service? I believe Miller provides better service than any other brand. I base this on years of experience and from talking to users of all brands of tig welding equipment. I still recommend the good ole syncrowave 250. Take my advise and look on ebay or craigslist. Sometimes You can pick one up for less than 2000 bones. Even better when a cooler is included. A Bargain.!! TIG welding with a Stick Machine??? You can TIG with almost any DC welding Stick welding machine and you can stick weld with any almost any TIG machine. Why buy a TIG machine then? 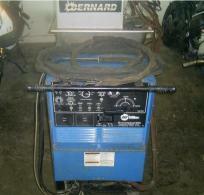 Well TIG machines, that is welding machines that are specifically designed for TIG welding, simply do it better. They have features like high frequency start, remote amperage control, and solenoid valves for shielding gas. TIG welding with a DC stick welding machine involves scratch starting and using a torch with an argon valve built in. But if you just want to be able to make good looking welds on thin metal and you already have a DC stick welder, you will be surprised at what you can make happen with a scratch start TIG rig. How to hook up a scratch start Tig Torch to a Stick Welder. Oh,, and one more useful tip... If you just need to burn a stick rod or 2... Why bother changing over to a stinger? This really works! Does Tig welding have to be so slow? Tig is always slower if you do it by the book. But why not think outside the box and break the rules? On some metals you can weld pretty fast. Especially if you consider there is no cleanup afterwards. How do you weld clear anodized aluminum? Most guys that weld tuna towers and marine parts can give you some tips on this. Most of them hook up a switch on the torch and "bump weld" manually by going from on to off again and again slightly overlapping puddles. This seems to break though the anodized coating. Boat owners will not put up with ugly welds or welds with a bunch of sanding or wire brush marks. That’s a really broad question. But here is some good basic information: Carbon steel? But you are not sure exactly which grade? 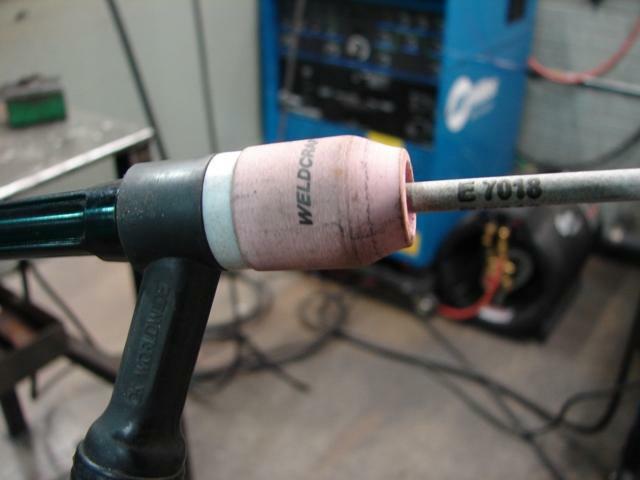 , use e70s2, 3, 4 or 6..er70s2 is the most common and easiest to get at your local welding supply. There are a few good ways to get an idea of what metal type you are dealing with. First off use a magnet. If the metal is magnetic it is either carbon steel, cast iron, cast steel, a magnetic grade of stainless steel or severely cold worked stainless steel, or pure nickel. Not magnetic? Could be practically anything else. Aluminum, titanium magnesium, copper, cobalt, nickel alloy? Spark test is another way to narrow it down, but it takes a lot of practice. carbon steels make lots of sparks and the pattern of sparks is different depending on how much carbon content. 300 series stainless sparks a lot less and the sparks are more red. Titanium sparks like a mother whiz monkey. Bright yellow almost white sparks that stream like several feet.